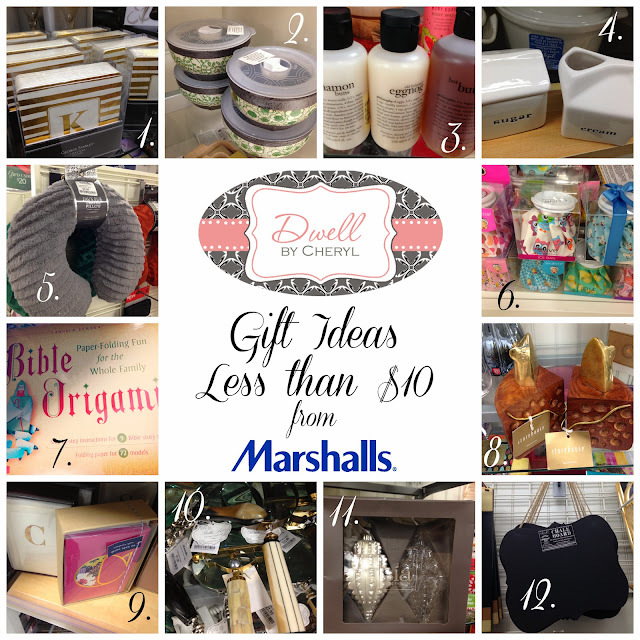 Dwell by Cheryl: The Gifter: Holiday Gift Ideas Under $10! Hope you guys had a great weekend. It's amazing that it's already the second week in December and Christmas is literally right around the corner. If you're anything like me, you've still not made a dent in the Christmas shopping yet. Never fear! I've rounded up some great budget options for everyone on your list. Have you guys been to TJ Maxx, Marshall's or Home Goods lately? Have you seen the new "The Gifter" commercials? Well, they've stepped it up and their stores are PACKED with awesome gifts. I've been watching some of my blogger friends round up some great options and I thought I'd do the same for you. However, being the budget-focused blogger that I am, I've decided to only include items that are less than $10. Yep, $10! Let's face it, $20 gifts can add up, quick. Before you know it you've well exceeded your holiday budget. You'd be surprised what great things you can find for less than $10 at the three stores I affectionately refer to as the shopping trinity. 1. Know anyone who just decked out a bar (hint, hint)? These gold monogrammed coasters are spot on. The perfect $4.99 hostess gift. 2. I'm obsessed with these beautiful ceramic microwavable bowls. The plastic lid is even vented. The smallest one is priced at only $2.99 and I almost walked away with the largest one in a beautiful blue, black and white print for $7.99. Beautiful and functional. Love these!! 3. Who doesn't love Philosophy? They produce such great quality bath products and I love the seasonal options they make each year. These small bottles were only $4.99. At that price, you could pick up a duo. 4. I have no words for how much I love these sweet cream and sugar servers. Brace yourself, these were just $2.99 each. 5. Know anyone traveling this holiday? These neck pillows were great and they look way better than the one's sold in the airport for much more. 7. The Sunday School teacher in me loved this box of Bible Origami. A $10 gift that would be great for the kids in the family and they may just provide a few teachable moments for the whole family. 8. I've had my eye on these mice and cheese bookends for months. They are now on clearance and such a conversation piece. 9. I believe in the power of a handwritten note and these boxed note card sets are just the write "little something" gift for neighbors or coworkers. 10. Magnifying glasses have been making a big splash in design lately. They had tons of options at my local store and several were priced at $7.99. Design is in the details and one of these would be gorgeous atop a stack of beautiful coffee table books. 11. Most of us have at least one ornament exchange. This boxed set included two beautiful ornaments. I like the fact that these were special but not so specific. They'd look great on just about any tree. 12. I'm all about a DIY project, but at $7.99, I don't know if I could make this chalkboard any cheaper. Such a cute option for any room. I told you they'd stepped it up. Can you believe all of those options are less than $10. We've got no excuse now not to finish up that holiday shopping. P.S. No one paid me to publish this post, although I wish they had. ; ) Have a great one! Are your subscribed yet? If not, it's easy. Don't miss a post. Have it delivered to your inbox! Great picks Cheryl! You can never go wrong with gifts from there!